A mutt named Frances from the streets of LA has found her calling as a teaching assistant. UBC education professor Ty Binfet rescued the female dog just over a year ago and put her through extensive training to become a highly skilled therapy dog. Animal-assisted therapy promotes social and emotional well-being in individuals through animal contact. It is designed to calm clients, facilitate social interactions, build confidence and can bring individuals out of their shell. Binfet and Frances arrived in August at UBC's Okanagan campus, where the dynamic duo provides education students with a unique classroom learning experience. "I use Frances in my behavior management and childhood development classes in both an active and passive way. It is a progressive way of teaching, and one that I've found to be very effective," says Binfet. For instance, in Binfet's behavior management class, education students strategize and plan a behaviour exercise to teach Frances, and then attempt to do so within a set amount of time in front of their classmates. This challenge provides a safe and honest training ground for students to learn about approximations and shaping of behavior, explains Binfet. "We draw parallels between Frances and kids in classrooms," he says. "I am in no way saying kids are like dogs, but there are a lot of commonalities in how, as teachers, we might manage our approaches and guide the development of desirable behaviour. Frances is a very compliant participant who allows students a living lesson where they can assess their own delivery of skills, as well as practice and hone their skill development." In addition to his innovative classroom work with Frances, Binfet will begin a research project this February by examining how animal-assisted therapy impacts feelings of homesickness and sense of social isolation in first-year university students living in residence at UBC's Okanagan campus. 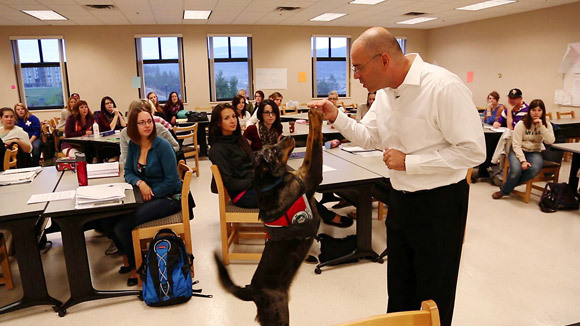 "Thanks to Frances and funding that has come our way, we’re looking at the use of animal assisted therapy by matching 10 St. John Ambulance volunteer dog handlers and dogs with homesick students here on campus," says Binfet. His job is to empirically assess whether the use of these dogs on campus can increase a sense of belonging and institutional affiliation to combat some of the loneliness, social isolation, and home sickness students can experience during their first year of university. 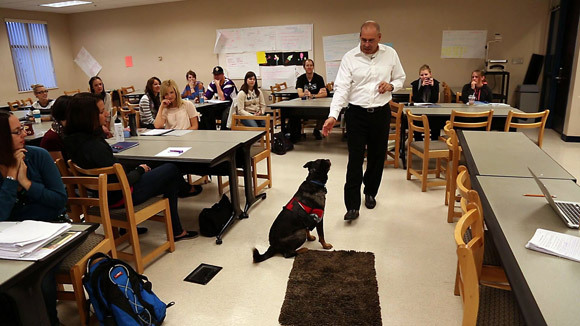 The project, which will run for eight weeks, is called Building Academic Retention with K9s (BARK), and is supported by Ian Cull, Associate Vice President Students. "There's a lot of information available about animal-assisted therapy but very little rigorous, empirical work, so that’s my contribution to the field." Binfet is quick to note that he does not advocate everyone bringing their dog to work, and wants to remind people that Frances has advanced behavior certification and university approval. However, ultimately, he would like to work towards establishing a K9 daycare for the pets of UBC staff and faculty that also serves as a drop-in centre for students to connect with pets and allows them establish feelings of connectedness, reducing their sense of isolation. "I purposely drive to campus every day on Innovation Way to remind myself that I am here to be a different kind of thinker. I'm here to push the boundaries a bit, and here to do what I think is intuitively good for the social-emotional well-being of students and evaluate that in an empirically rigorous way," says Binfet. "Having dogs on campus is one way of maybe getting us to reconsider things like how people feel accepted in classrooms, in dorms, and what a community can look like with the addition of four-legged companions."